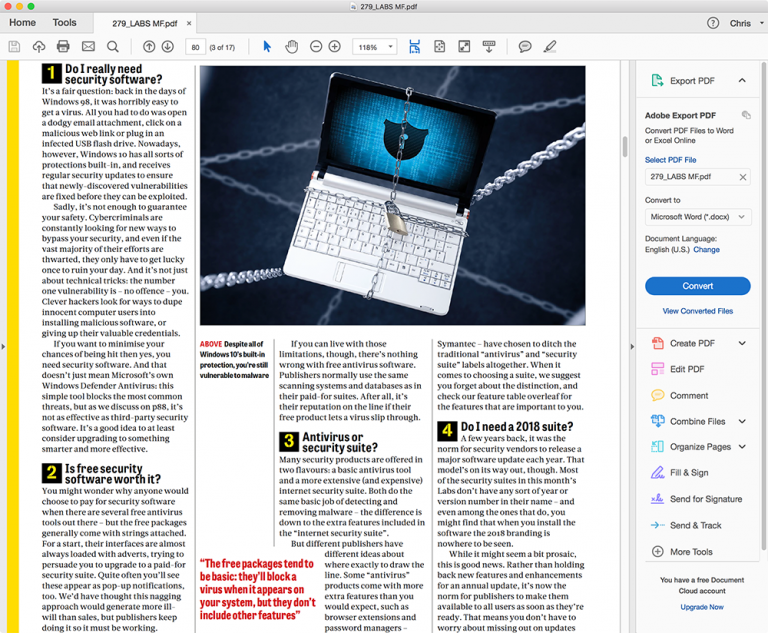 Let’s be fair, for reading a PDF your average end user will rarely need anything more than a simple reader, so Preview on the Mac or Edge on your Windows 10 PC will suffice. For business users, portable document format files offer a method for sharing commercial-grade documents which can be marked up before they are sent to a printer. Indeed, if you share your PDF through the cloud, anyone can download, view, add a comment and save it back for others to read the comments and make changes. Adobe has just released Acrobat Reader DC 2018 and it’s available free of charge. The latest version adds extensive cloud support. If you have an Adobe account, you can store your PDFs in the "Document Cloud", but you can also link to Box, Dropbox, OneDrive and any SharePoint location. Once saved to the cloud, you can view across various devices and share with other users. What else is new in 2018? Not a huge amount in the free version. You do get PDF 2.0 support, so you can view documents created in the latest version. PDF/A compatibility with veraPDF enables you to produce compliant documents. Annoyingly, the free Acrobat Reader DC 2018 contains all the functions you could possibly hope to use, but most of them require either an upgrade to the Professional version or a subscription. As an example, the new "Send for Signature" function enables you to send a complete PDF to another person to get signed off, but requires a $15/month continuous payment. To make basic edits, you need the Professional version, which is $25/month. You can’t convert your PDF to Word or other formats either with the free version. But, there’s a fair amount you can do. Apart from opening any PDF locally or from the cloud, you can add comments to an existing PDF and then save it to the cloud or other location. You can sign the document with your own details. The other advantage of using Adobe Acrobat Reader is that you use the same user-interface across Windows and Mac, making it easier to get the job done. Plus if you’re an Adobe CC user, it seamlessly sits within your existing Adobe framework. Upgrading to Acrobat Professional 2018 is worth it if you work heavily with PDF files. For example, in an environment where you produce a PDF before sending it to a commercial printer. The Professional version would offer all the editing functions, conversion tools, signature options and also tracking tools you’d need to work with various people. Download Adobe Acrobat Reader DC 2018.